Early bird rates for a table. Table seats 10 people, $75 per person. Please enter your table guest names, emails, your guests' entree preference (beef, chicken, or vegetarian) and any dietary restrictions. Full payment required. By 04/08/2016, you will be responsible for the remaining balance of your table. Regular pricing for individual tickets. UPDATE: The 2016 Gala and Scholarship Benefit is SOLD OUT! Thank you for your support! 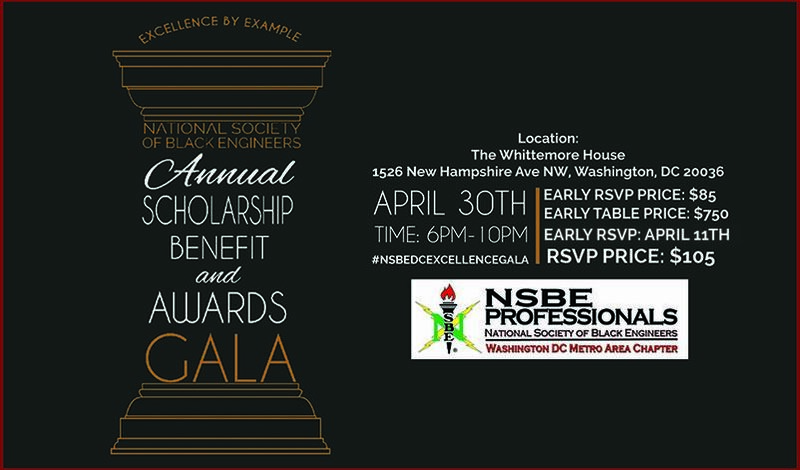 The DC Professionals Chapter of the National Society of Black Engineers invites you to celebrate another wonderful year at its 26th Annual Gala and Scholarship Benefit titled “Excellence by Example.” This year the festivities will be held at the majestic Whittemore House within walking distance of DuPont Circle (1526 New Hampshire Ave NW, Washington, DC 20036). Expect a great meal, an amazing speech from our speaker, and good music to finish the night! Proceeds will go to support our Future Innovators Scholarship Program, which provides scholarships to DC-area African-American seniors planning to major in a STEM field to attend college. Dress is Formal/Black Tie Optional. The keynote speaker will be David Johns, Executive Director of the White House Commission on Educational Excellence for African Americans. Post-dinner entertainment will be provided by the husband-wife DJ duo JayBeez! Nominations are open for individual, community, and corporate honorees who have contributed to the NSBE mission by encouraging African Americans to pursue careers in engineering and the sciences. The nominee does not have to be a member of the NSBE DC or any NSBE chapter. Please fill in your nominating form at https://goo.gl/P5TiDr. We will also have a silent auction and there will be a variety of items and services available for purchase. The list will be provided closer to the event. If you would like to donate an item for the silent auction, please fill out the donor form at https://goo.gl/ugXdGE. NSBE DC is a 501c3 organization. Seating is limited and ticket sales close on Monday, April 25, so we encourage you to inform your membership to purchase tickets as early as possible. Please forward any questions to the Special Events Chair Astin Ross at specialevents@nsbedc.org. If you would like an idea of how past events looked like, check out pictures from our 25th Anniversary Gala at https://goo.gl/EISuY7.